It is the final week of Wimbledon and two familiar faces are once again dominating the court. Genius Opposites Venus and Serena Williams have both made the semifinals at Wimbledon! Through the years, the results that these two have produced both individually and together are staggering. A total of 29 Grand Slams. over 100 singles titles and no less than 4 Olympic gold medals. And what about the inspiration these two older players continue to offer to young girls and women around the world? Venus and Serena stand for hard work, discipline and a belief that despite your beginnings you can triumph as champions in your mid-30’s competing with 20 year olds! Though Serena appears to have settled down in recent years, she still gives off more extroverted energy. At times, Serena’s frustrations with her playing spill out uncensored. She has lost her cool and thrown her racket many times. This week she just missed hitting a cameraman. Extroverts do thrive on having a lot going on and Serena runs a successful fashion business in addition to being one of the top players in female tennis. She is juggling multiple sponsorships which contributes to her status as the highest paid female athlete today. I would love to take a peek at her calendar to confirm this! The Williams duo illustrate two themes I discovered in my research for The Genius of Opposites, I found that introverts and extroverts consistently engage in “Destroying the Dislike.” What does that mean? When they respect each other and act like friends they can talk openly and have fun. These two sisters know how to Destroy the Dislike. Sparring partners from the time they were wee tots, they learned to challenge each other to each perform at their best. Check out this post-game doubles match interview where laughter prevails. They also know how to “Bring On the Battles.” Introverts and extroverts see disagreement as necessary to arrive at better outcomes because they challenge each other to come up with better solutions than they would alone. Venus once said, “It has been an amazing rivalry,” Serena said. “I think it has meant a lot. 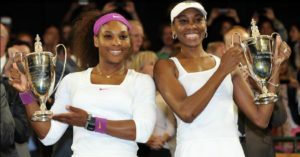 Venus and I have definitely proven that you can be enemies on the court and friends and sisters off the court.” They know how to use this tension to give us some of the greatest displays of tennis ever. We can all learn lessons about working with and respecting our different temperaments by watching the unparalleled Williams champions. This entry was posted in Uncategorized on July 3, 2016 by Jennifer Kahnweiler.